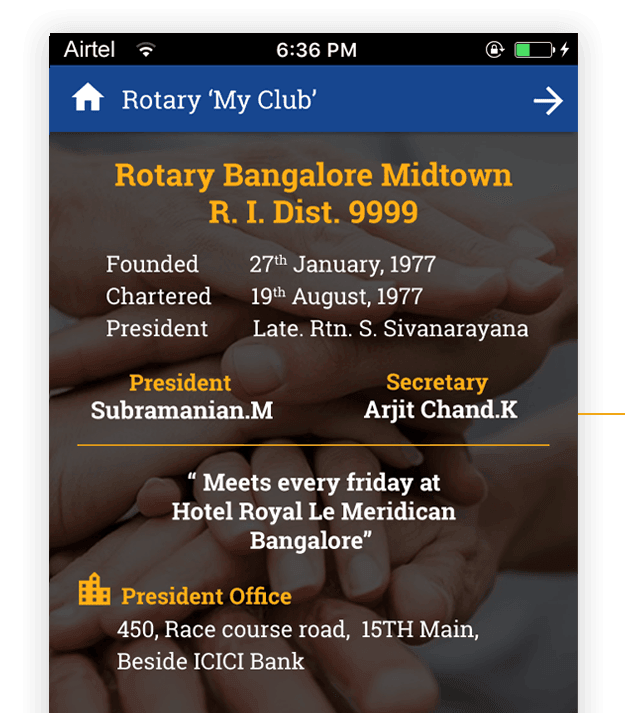 Why an App for Rotary? Engaging Members is the number one agenda of any club. Meaningful Engagement determines a clubs’ growth. In todays world ‘providing information’ is more apt than ‘pushing information’. Information / communication that are sent by email, sms (pushed) aren’t likely to catch the attention of your members. Providing Information when the member wants is a key differentiator. 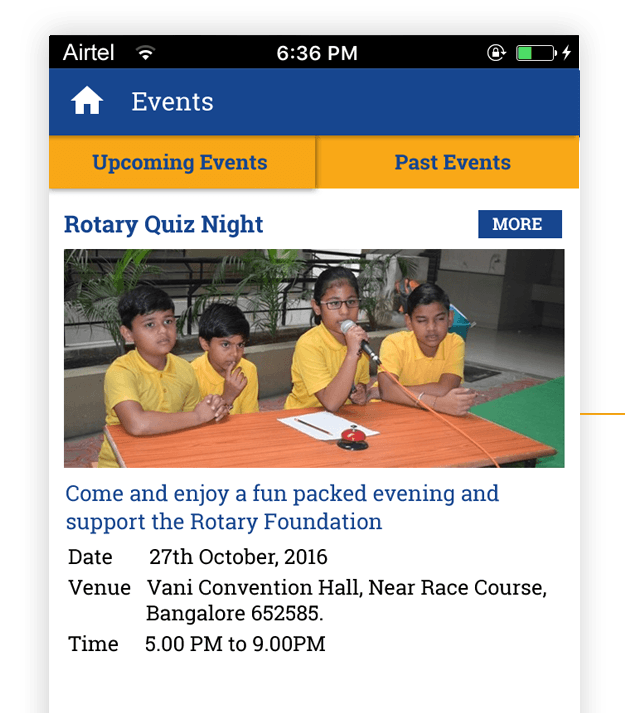 The app for Rotary Clubs has been successful because of this. Self Sustaining – no effective cash outflow or expense for the club. 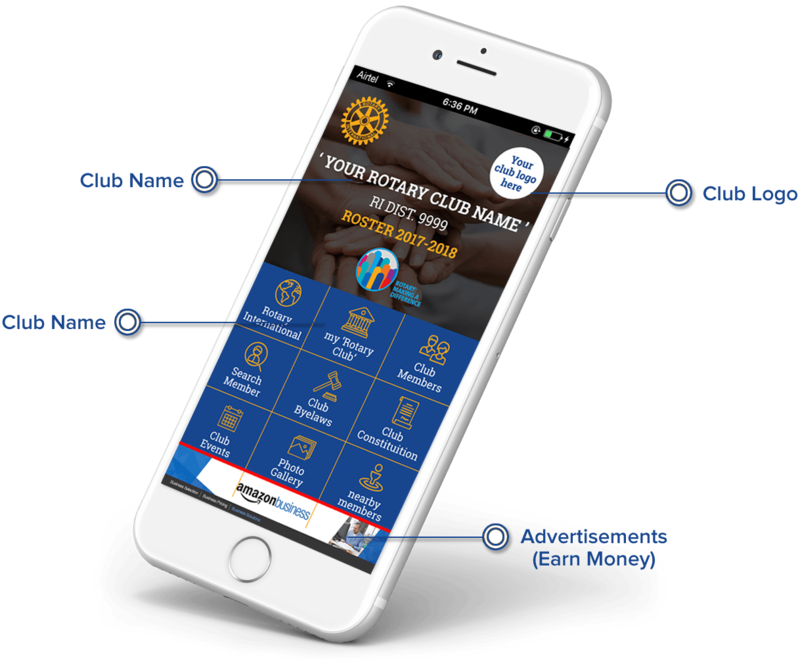 The app comes with advertising options which will be subscribed to by the club members. Most of the clubs have seen a positive cash flow or earned profits from advertisements on the app. 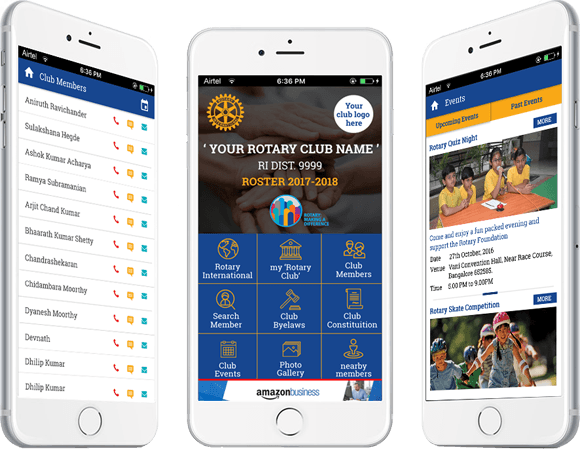 Now is the the time to act and get an app for your Rotary Club. You can locate a member easily by using the search option. 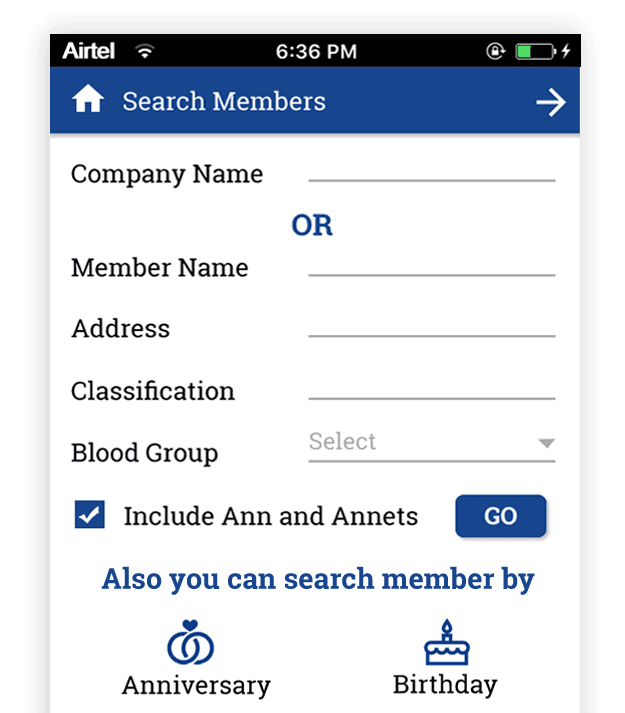 Search by company name, member name, line of business / service, part of address, blood group etc., Search by business line is a wonderful concept for new members who are yet to socialize with the full group. This also helps when a member has more than one business line. Rotary concept of generating business thru its memebers has always been its greater asset and this functionality supports this to the hilt. This is the club roster on the mobile. 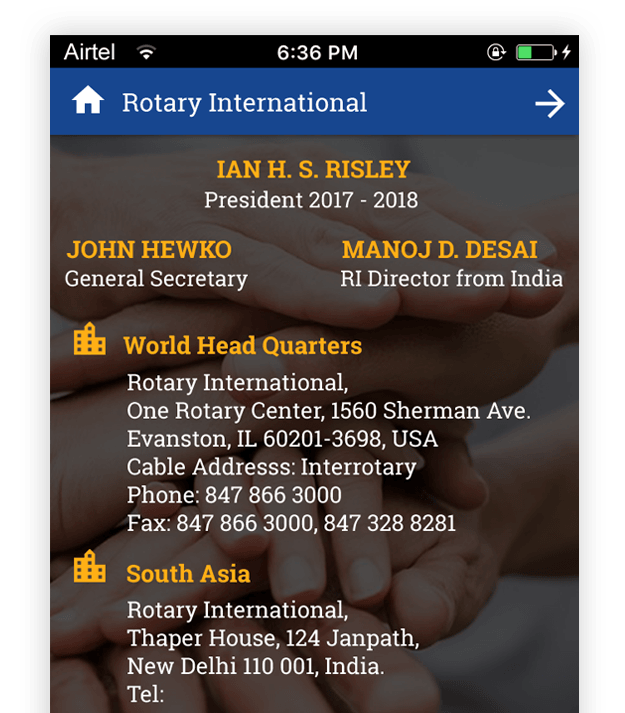 Members can connect instantly using the call / message / email tabs – they don’t have to dig into the contact list (yet another first by us for the Rotary fraternity) From this screen you can drill down to view the member profile. The profile has provisions to display member and ann photo as well. Contacting the member on his mobile, office & residence phonea are again just a touch. From ths member list screen, you can also view the Events (Birthdays & Anniversaris) by the month. Rotarians cannot afford to miss out wishing their Rotarians on their Birthdays & Anniversaries. 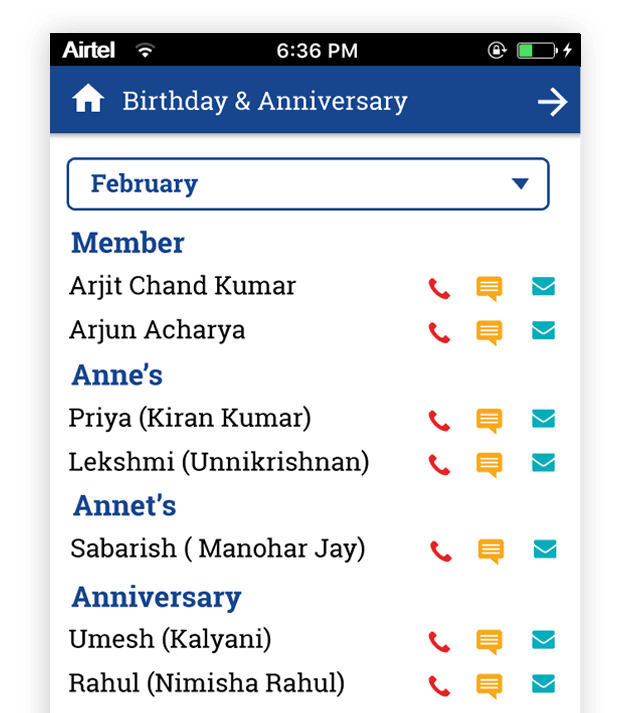 Our app for Rotary Clubs displays the list of Birthdays & Anniversaries in the month (Rotarians, Ann's & Annette's as well). Dissiminating event information has become that much more easy now. Members get to see the information on the app and needn’t have to search in their ‘Inbox’. Past Event archives always bring back fond memories. The app helps in retaining events & event photos of even decades. The ability for a member to search & retrieve the events by event name or by period makes it much easier and a quick acceptance of the app. 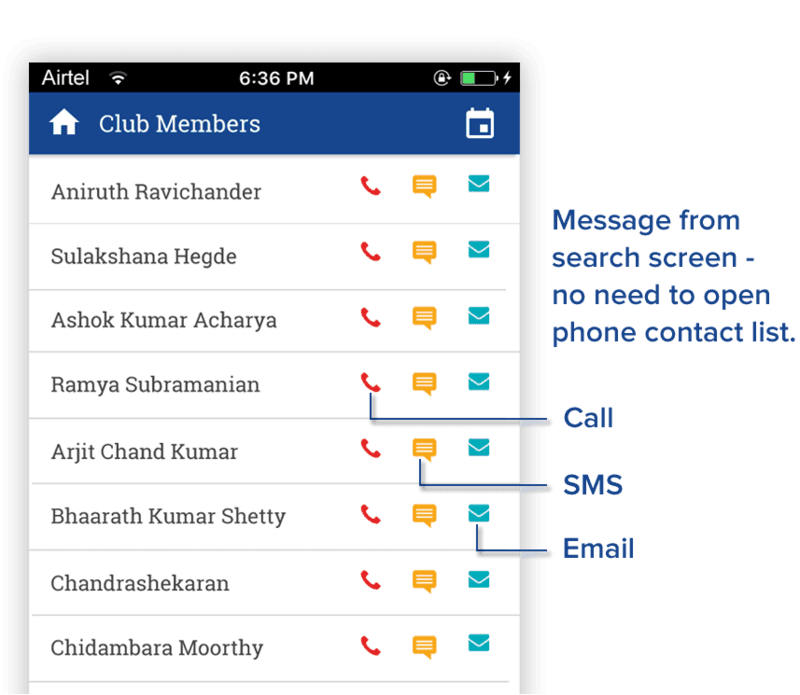 Now carry your club's digitized Roster on your mobile device and view details of your members' with a few clicks. Never forget your fellow Rotarian's special days, with automated reminders for Birthdays and Anniversaries. Have reminders for events, such as weekly club and committee meetings. View profile of any member instantly. you can also view anne & annet profiles. 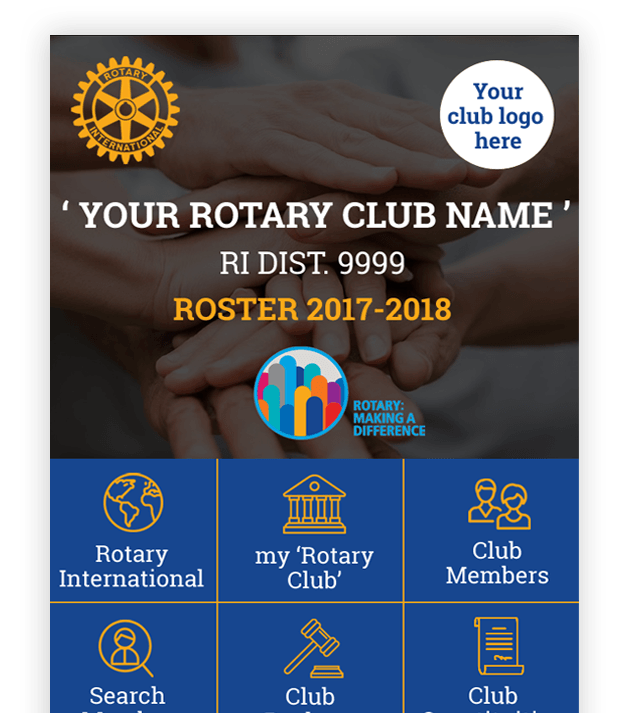 Never miss out on important News from your club, District or Rotary International. Now, sending and receiving important News is at the tip of your fingers. Finding a member near you with just a click. "Near Me" allows you to connect or meet the member in person. Recognize and celebrate the splendid initiative/ work/ project of your club,committees or members. Share achievements with fellow club members. Easily Know and connect to your club's respective Board of Directors. Anne's & Annet's can download & use the app absolutely free of cost. The images and contents of all your Club Projects are displayed - like,comment and share. View and learn about the tenure of Past Presidents who have served your club.